Trogulus tricarinatus is recorded in England and South Wales, with all records since the early 1990s confined to the south-east of England. The most recent northern records were around Sellafield in Cumbria in 1993. Whether this contraction in range is real or an under-recording artefact is unknown. Its distribution is closely linked to its snail prey. The species was first recorded in Britain at Bloxworth, Dorset, by O. Pickard-Cambridge (1890). Its European distribution includes France, the Netherlands, Greece, Scandinavia, Switzerland, Bulgaria and Poland (Wijnhoven, 2009). It is known to have been introduced to New York State in North America (Muchmore 1963). Like Anelasmochephalus, this flattened, short-legged species is restricted to the ground layer in calcareous soils and is a specialist (but not obligate) snail-feeder. Its main habitats are woodland and grassland. It is most easily found by sieving soil but has been collected from under stones, logs and in leaf-litter. 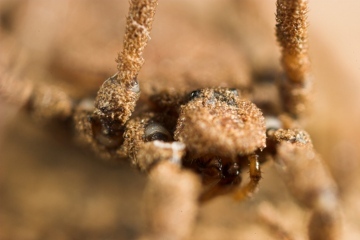 Both Trogulus and Anelasmocephalus secrete a glue by which soil particles adhere to their bodies - presumably providing them with visual camouflage (against birds?) and possibly also allowing them to blend chemically and physically with the soil environment. Hooded mouth-parts may reduce the problems of feeding caused by soil and snail mucus. The species’ habit of playing dead (catalepsy) and blending with soil particles makes it difficult to spot for birds and other visual predators (and also humans). Juveniles are generally free of soil and a lovely purple colour. Adults are present throughout the year and may live for up to three years. Eggs are laid in the empty shells of snails and protected with a web-like secretion from the ovipositor (Pabst 1953). In Britain its altitude ranges up to around 260m at the Yorkshire sites (HRS). Status This is a relatively scarce species and, although locally common, there is an apparent contraction of its range in Britain towards the south-east of England. The main threat is linked to any decline in abundance their snail prey. This may be occurring in less calcareous areas due to acidification of soils. Use of molluscicides in agricultural areas may also be a problem. Text based on: Hillyard, P. D. 2005. Harvestmen: keys and notes for the identification of British species. Synopses of the British Fauna 4 (3rd edn). Field Studies Council, Shrewsbury. Pickard-Cambridge, O. 1890. Monograph of the British Phalangidea or harvestmen. Proceedings of the Dorset Natural History and Antiquarian Field Club, Sherborne/Dorchester 11: 163-216. Pabst,W. 1953. Zur Biologie der mittleeuropaischen Troguliden. Zoologische Jahrbucher (Systematik, Okologie und Geographie der Tiere) 82: 1-46.